Moser Engineering products will once again adorn the 2016 Summit SuperSeries American Race Car built dragster that will be awarded to the Top ET National Champion in October. Moser will supply the entire 3rd member and disc brake package ensuring the Trick Flow powered big block Chevy will have plenty of stop and go power. The Summit SuperSeries dragster will feature Moser’s all new Pro Extreme axles. The new Moser Pro Extreme design looks different for good reason. Designed and engineered after the popular Full Floater Hub shape, this design delivers maximum performance and torque delivery available from a flanged axle design. This design is the newest engineered update to a flange style axle in 20 years. The Moser Pro Extreme is a is a 40 spline, Pro-flanged, gun-drilled axle manufactured out of premium quality alloy steel, forged from Moser Engineering designed tooling, induction heat-treated to optimize torsional strength and 100% magnafluxed. The Moser Pro Extreme axle can withstand tremendous horsepower while being lighter than a standard 33 spline axle. The Moser Pro Extreme can be splined to fit any manufacturer's spool and carries a standard 10-year limited warranty. A Moser Thru-Bolt Aluminum Case will be used to keep the axles and gears working in harmony. The Moser thru-bolt center is one of the strongest units on the market and will save 14 lbs. of static weight over iron. Moser Thru-Bolt Aluminum cases are made of 356-T6 aluminum with 7075-T6 aluminum caps and bil­let steel adjusters. They feature a super strong thru-bolt design to give the case increased strength and decreased ring gear deflec­tion common in most aluminum case designs. All Moser Thru-Bolt Aluminum Cases are drilled for the 3/8” stock pinion studs and 7/16” heavy duty studs. Moser Thru­-Bolt Aluminum cases are designed to be used with either a standard pilot bearing with snap ring retention or a heavy duty, wider pinion bearing utilizing button head bolts for retention. The Summit SuperSeries dragster is proud to feature the best thru-bolted aluminum center section on the market. The M9 Drag housing will be called into action to hold everything together. The M9 is made from 1/8” thick laser cut mild steel. What differentiates the M9 Drag housing from oth­ers brands available is the fact the Moser M9 Drag is fabricated from one tri­angulated piece of metal. This helps reduce deflec­tion caused from torsional force at launch, which helps with a straighter and more consistent launch. Other standard strengthening components added to the Moser M9 Drag housing include internal gussets and bulk heads and a 3/8” thick face plate. Also included are custom ma­chined fill and drain vent, stud kit and installed housing ends. To ensure that the 1,000 horsepower Trick Flow powered ride stops as good as it runs, Moser Engineering’s revolutionary new standard for safety and performance in Performance drag brake kits will be used. The anodized cali­pers help eliminate corrosion and preventable wear. A dual pin is used for pad retention and o­-rings are used to eliminate pad chatter. For the revolutionary rotor/hat design they designed a 2 piece keyed, slotted and drilled rotor combined with a hat that utilizes a spiral retaining ring to help allow more radial growth during high temp cycles than the competing designs in the market. This helps to reduce the sticking and warping that occurs in most other designs under heavy braking. Our Caliper along with the keyed rotor and hat design has years of R&D and track testing to assure reliability and performance. For more information on Moser Engineering’s complete line of products, visit their website at http://www.moserengineering.com. 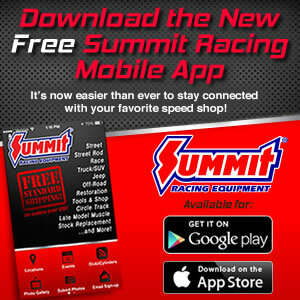 Best of all, the exact same components that will be used in the Summit SuperSeries dragster build can be yours with just a click to http://www.summitracing.com to check out Summit Racing Equipment’s massive online selection of these and many other Moser Engineering products.